Some of this, some of that..
A word about my mentor. 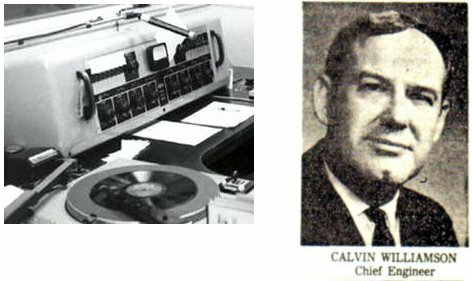 I owe an untold debt to this man, Calvin C Williamson, a war-time Navy sparks, who took the time to teach a young me (and my short attention span) the in's and out's of electronics and radio technology. Back in the days of a "First Phone" at the transmitter, Cal would hold court and I would learn, usually while he "stood watch" during directional operation. Cal had the patience and "way with words" to make learning a pleasure. He totally knew his craft. When the present 103.7 the "Q" in Birmingham, was plain ol' WLJM in Gadsden, this was me about 1972. 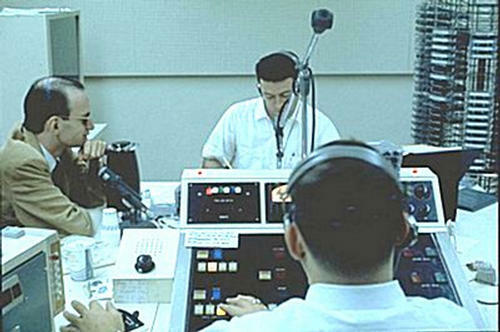 Charlie Boman operated this FM and the AM counterpart WJBY. To hear the AM, when I was the P D, hit REELRADIO and listen. We had a Collins 212-S console, SMC automation, a Gates remote control, an Audimax and a McMartin mod monitor in there, but I would trade it all for that 77DX. 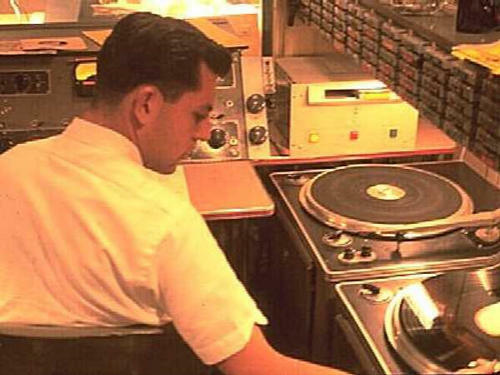 In this "pre-cart machine" era photo, you can see the original Rek O Kut B16H turntables in place with Gray Research arms, and an Ampex 600 to play commercials. (There were probably two). 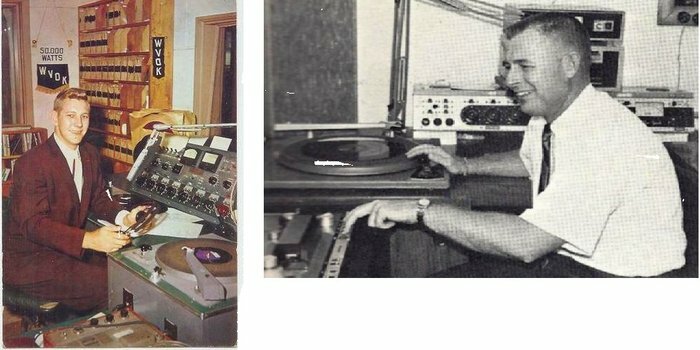 The picture on the right shows Johnny Davis (Jim Romine) in the production room with a GATES Yard and an Ampex 440 and Gates t Table. Thanks again to Harold Brown for sharing. 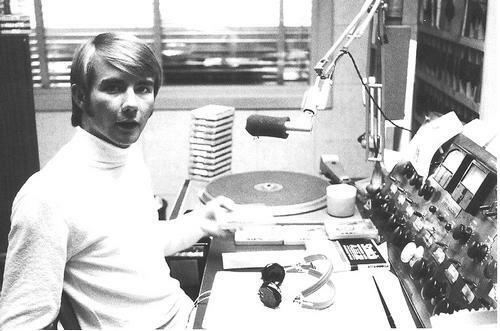 77, W A B C "NEW YORK CITY"
In the early days, WABC had Collins/ATC P150 or PB 150 cart machines either side of a custom slide fader console, with no wall between the talent and the talented engineer. Jay Sclar tells me that is Scott Muni, at the mike. You really should visit the WABC site, it's great, with a lot of detail about WABC. This picture thru the courtesy of Jay Sclar who was there with the camera in NYC back in 64 and 64, and thus furnished a lot of pictures for the webpages. WMCA was using an RCA BC-2 when this one was made. Notice the extra pots that have been added to the end of the board to mix in the cart machines. Those are tube type Collins 642's. Joe Rumore's basement home studio. 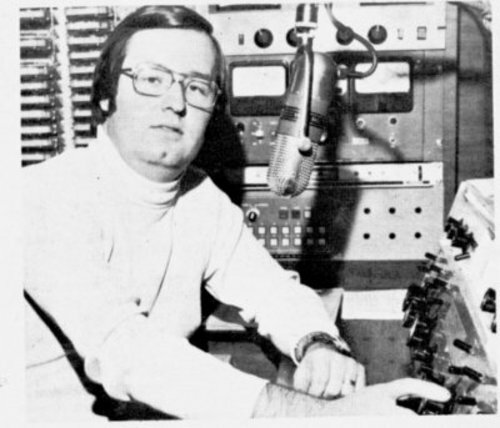 If you grew up in Alabama, you listened to Joe Rumore sometime in your life. Joe was on WVOK in Birmingham blowing across north Alabama with ease using the WVOK 50,000 watt signal at 690 on the dial. 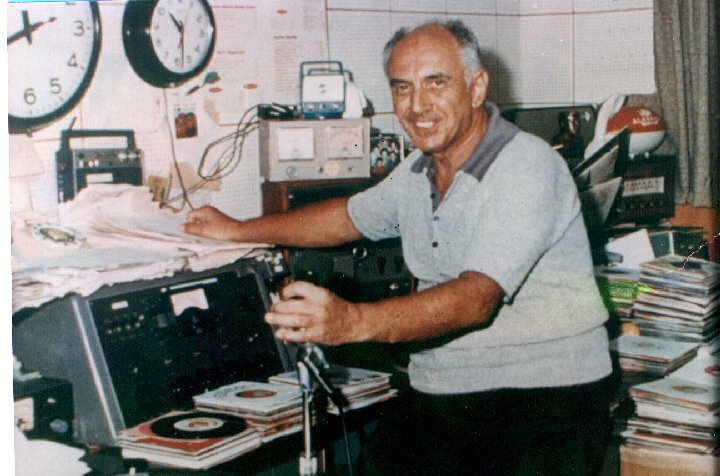 He was on at Noon and also in the the afterrnon slot on the "Mighty 690" playing the hits from his basement studio at his home. How cool is that?